Prince George’s County Executive Angela D. Alsobrooks draws over 100 business leaders to her call to increase youth summer jobs from 3,000 to 6,000 this year. PHOTO: RICHARD MONTGOMERY // RIXSTAR STUDIOS. The county executive has been fired up about making a more comprehensive investment in county youth and it all started as she was serving as state’s attorney. For Alsobrooks, it was the beginning of a crusade-like effort. 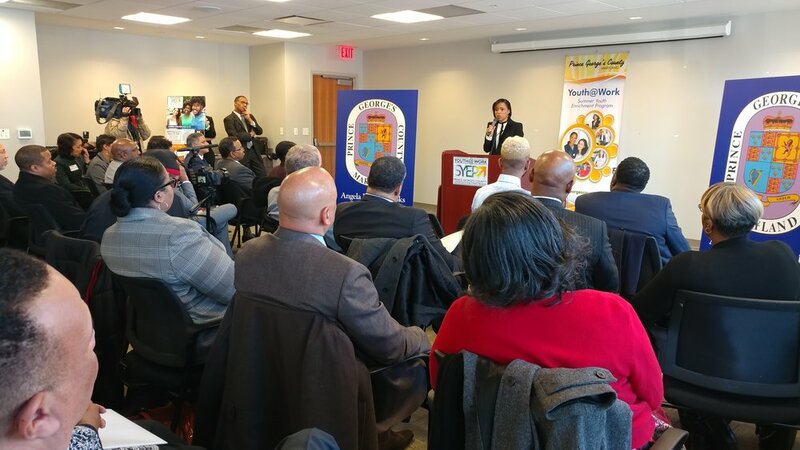 Teaming with the Baker Administration and the county council, the SYEP program was expanded to 3,000 young people in 2018. But that’s not enough. Now Alsobrooks wants to push to getting 6,000 kids and young adults employed this summer. The Alsobrooks Administration, fully invested and now in the driver’s seat, also seeks to expand the SYEP program to ages 14 through 22. The administration is now reaching out to area businesses to enlist their support in getting more youth employed this summer – cultivating a better direction for young residents while creating a stronger future workforce for the county. Major Riddick, Chief Administrative Officer of the Alsobrooks Administration, wasted no time in recruiting respected leaders to the task. Key testimonials were offered by Conrad Samuels, a program manager at PEPCO as well as by former SYEP job holders Ian Spears and Kwasi Fields who shared remarks as youth participants in 2006 and 2016 respectively.